Born on March 1st, 1921 in Manhattan, Terence Cooke was the third and youngest child of Irish immigrants. His father was a chauffeur; his mother died when Terence was only nine. The child of a devout family, Terence manifested an interest in the priesthood at an early age. He entered Cathedral College and from there went to St. Joseph’s Seminary. 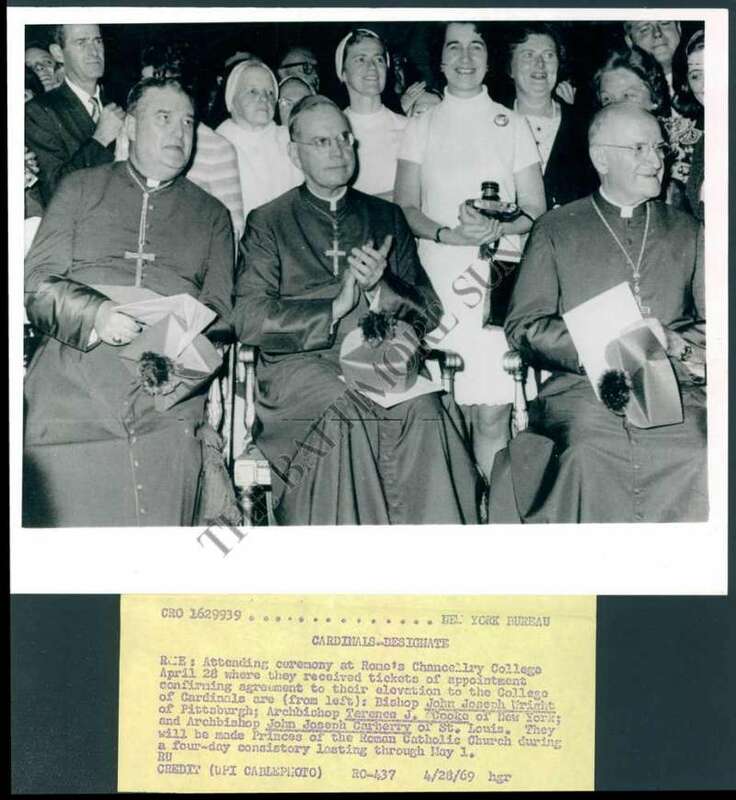 The future Cardinal Archbishop of New York was ordained by Francis Cardinal Spellman on December 1, 1945. The young priest served as chaplain at Saint Agatha’s Home for Children before going to the Catholic University of America for graduate studies in social work. From there he went to Saint Athanasius Parish. Later he directed the CYO, was procurator of St. Joseph’s Seminary, and secretary to Cardinal Spellman. He then became Chancellor of the Archdiocese and finally Vicar General. 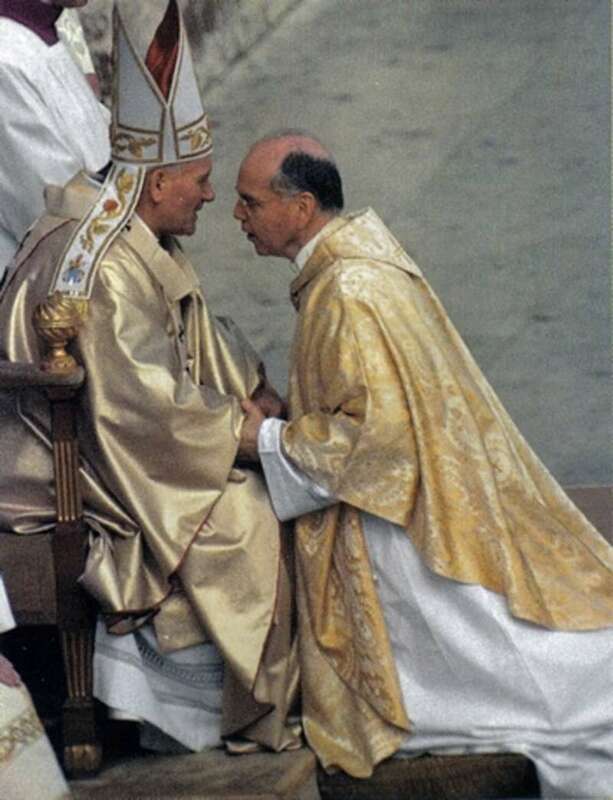 He was consecrated bishop in 1965. Barely three years later Cardinal Spellman died, and the world expected him to be succeeded by one of the senior prelates of the Church. 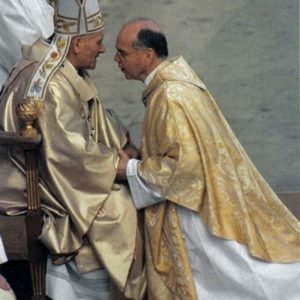 Pope Paul VI, however, had other ideas and chose instead a devout, relatively unknown Vicar General. And at the age of forty-seven Terence Cooke found himself Archbishop of New York and Military Vicar for the United States. This is a signed letter from Cardinal Terence Cooke to a Cuban Bishop, Carlos Riu Angles in 1966. 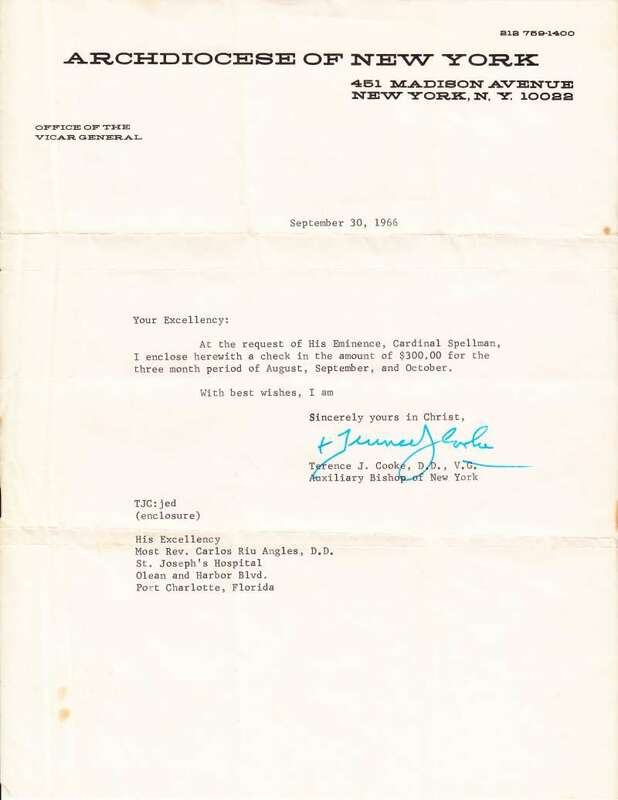 The signed letter from him is of special value to the Collection because there is a cause for his canonization. 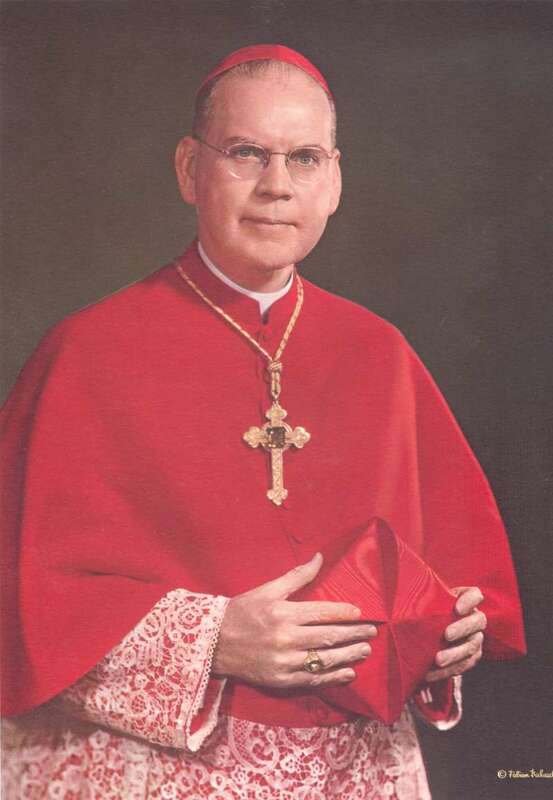 On April 28, 1969, a ceremony was held in Rome confirming Terence Cooke had been designated Cardinal by Pope Paul VI. This is a photograph of that ceremony. The Inner-City Scholarship Fund to support inner-city Catholic Schools, and help children of all races and creeds. Catholic New York (the Archdiocesan newspaper), to disseminate the Catholic perspective on world and local events. Ever concerned with the needs of others, Cardinal Cooke was instrumental in improving care for terminally ill cancer patients. He also coordinated fourteen general and special hospitals under the Department of Health Services of Catholic Charities to better serve the sick and the dying. He maintained a lifelong commitment to Casita Maria, a pioneer youth-oriented service agency for the Puerto Rican community in New York. Catholic Charities programs for the imprisoned, the handicapped and the disadvantaged were initiated by him. No group was forgotten; no one was abandoned. Terence Cooke had a special love for the aged and the young. During his time as Archbishop construction was completed on nine nursing homes that were affiliated with Catholic Charities. Under Cardinal Cooke, the Catholic Church cared for sixty percent of the abandoned and neglected children in New York City. Always an advocate for the young and aware of the growing problem of New York’s homeless and at-risk youth, he strongly supported Covenant House and other institutions that cared for the thousands of teenagers who would otherwise become prey to drug addiction and prostitution. He particularly enjoyed and supported three movements in the Church in which women had an equal role with men. These included the Cursillo Movement, the Christian Family Movement and charismatic renewal. Diagnosed with cancer in 1965 and considered terminal from 1975 onward, Cardinal Cooke endured surgery and then chemotherapy for years. Despite this he kept to his hectic schedule and gave of himself to all who needed him. Seeing the needs of others as paramount, he prayerfully accepted his own problems as a share in the sufferings of Christ. His Episcopal motto, Fiat Voluntas Tua (Thy will be done), says it all. These words, which proclaim a joyful surrender to the will of God, were never a mere motto to Terence Cooke; they were the bedrock of his profound spirituality and the source of his strength. Although his health continued to worsen, he continued to live life joyfully, fully, and for others, trusting completely in the love of God. When others might have yielded to illness, he simply increased his efforts and presided over an expansion of the Archdiocese that emphasized education, health care and social services. On October 6, 1983, Terence Cardinal Cooke died a holy death in the Cardinal’s residence. The Cathedral of Saint Patrick overflowed with people as he lay in state. Lines of mourners surrounded the Cathedral, waiting to pay their final respects. They came to him in death as he had welcomed them in life: the poor with the rich, the old with the young, the famous with the obscure, those of all faiths and those who proclaimed no faith. Each of the many ethnic communities that make up New York, felt a profound personal loss. The front page of El Diario, New York’s Spanish language newspaper, said it for everyone. Adios Amigo. All these people had little in common, except a need to bid farewell to a beloved priest who had touched their lives. But how had he done it? How had he affected so many? We can only say that he did it by living a life of genuine holiness, by living his life for others. And then we must ask: Is that not the definition of a saint? Papal Artifacts gratefully acknowledges the Terence Cardinal Cooke Cause for Canonization web site for their generous use of biographical information.